T-Mobile’s EmpowerED program aims to narrow America’s homework gap by providing off-campus devices and data plans to students at eligible schools and districts. To apply, download the application and share how this program would benefit your students. Many families in the U.S. don’t have high-speed Internet at home. This problem is called the Digital Divide. But to succeed academically and compete in today’s digital world, every student needs equal access to online learning. Without this access, disconnected students can fall behind their wired peers, creating the Homework Gap. Mobile access has the power to close the Homework Gap. 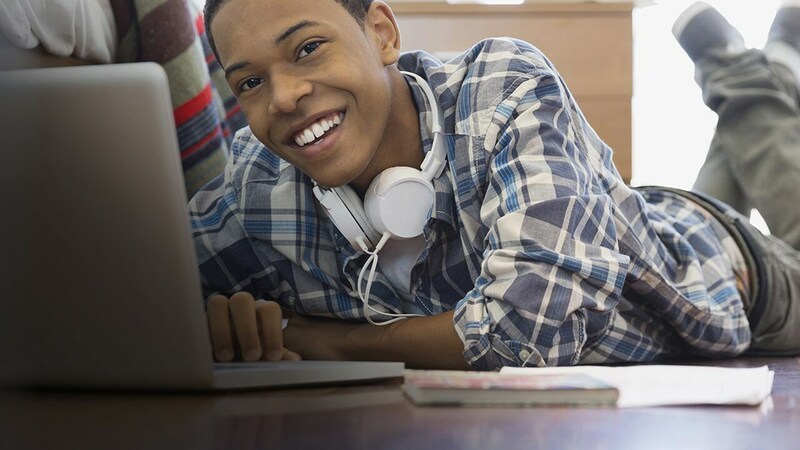 T-Mobile plans to narrow the divide with EmpowerED™, a program that provides wireless devices and service plans to help students and schools succeed. A subsidy of up to $200 per mobile Internet device, for devices over $200. 2GB for $10: Up to 2GB of high-speed data, followed by data at reduced speeds up to 128kbps. T-Mobile will waive the $10 service charge for the 2GB plan for the applicants that demonstrate the highest need. T-Mobile will award a limited number of waivers at its sole discretion. T‑Mobile ONE Unlimited LTE for $20: Unlimited on-device 4G LTE data. Video typically streams on T-Mobile device at DVD quality (480p). On all T-Mobile plans, the small fraction of customers using over 50GB/mo. may notice reduced speeds until next bill cycle due to data prioritization. Tethering at max 3G speeds. Sales tax and regulatory fees included in monthly service price. Planning, implementation, and deployment support. Content filtering, which helps prevent access to adult content. EmpowerED participants may choose one of these options at no additional charge: (1) Web Guard filters http web page content on our network; or (2) WebTitan by TitanHQ™, a thirdparty product which can filter even secured (https) traffic at the domain level. Schools that do not use a T-Mobile-facilitated filter thereby acknowledge that they will provide their own CIPA-compliant filter on all EmpowerED devices for the duration of their use. Students and their families will not be required to pay any money for devices and/or wireless service received through this program. At least 40% of students receive free or reduced lunch at each school. Each school is located in an area where T‑Mobile has 4G LTE coverage over at least 80% of the school’s geographic enrollment zone. T‑Mobile will validate eligibility for this requirement; to see coverage in your area please check our coverage map. At least 15% or more of students are dropping out of high school (aggregate for all high schools if a school district is applying). At least 15% of students are not grade-level proficient in math and reading by the 9th grade (aggregate for all high schools if a school district is applying). Submit your application to EmpowerED@t‑mobile.com. All applicants meeting the eligibility criteria will be invited to participate in a phone interview. Following the interview, applicants will be informed as to whether their application has been approved. Program eligibility and approval is determined at T‑Mobile’s sole discretion. T‑Mobile is committed to the success of this program, and that means measuring impact. If your school district is approved, T‑Mobile will work with you to collect data from all students with access to off-campus mobile broadband access. Commit to training relevant teachers and administrators on how best to utilize the devices and service. Provide annual aggregated data by grade level at each school, including ELA proficiency, math proficiency, and tardiness/attendance. Your school’s current data collection process and metrics are sufficient. T-Mobile is not asking for new metrics that are not already part of your reporting process. Conduct two anonymous online surveys, created by T-Mobile, about student technology usage with students and teachers. The first survey will be administered prior to the student receiving access and the second will be held at the end of the school year. Capable device required to achieve 4G LTE speeds. Limited-time offers; subject to change. Not eligible for other discounts. U.S. roaming and on-network data allotments differ: includes 200MB roaming. Partial megabytes rounded up. Not for extended international use; you must reside in the U.S. and primary usage must occur on our U.S. network. Service may be terminated or restricted for excessive roaming. Communications with premium-rate numbers not included. Video streaming at up to 1.5Mbps; may affect speed of video downloads. For best performance, leave video streaming applications at default automatic resolution setting. Tethering: at max 3G speeds. For the small fraction of customers using >50GB/mo., majority of data usage must be on tablet. Network Management: Service may be slowed, suspended, terminated, or restricted for misuse, abnormal use, interference with our network or ability to provide quality service to other users, or significant roaming. Tablet usage is prioritized over tethering usage, which may result in higher speeds for data used on tablet. See T‑Mobile.com/OpenInternet for data management details. Coverage not available in some areas.